M rs. Ann G. Brown, 85, of Queensbury, NY and formerly of Whitehall, NY passed away peacefully surrounded by her family, on Sunday, April 7, at the Glens Falls Center. Ann was born on February 15, 1934 in Whitehall. She was the daughter of Roland and Louise Burke. Ann received her education in the Whitehall schools and was employed at Scott Paper Company in Fort Edward, NY, for twenty-eight years, retiring in 1988. 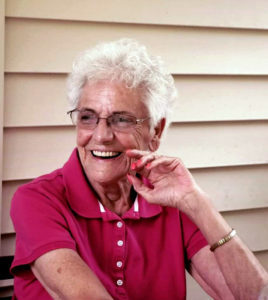 After surviving lung cancer, Ann gave back much of her time as a volunteer with the Glens Falls Hospital Guild at the Cancer Center for many years. Ann was fiercely independent and the matriarch of her family that she loved so dearly. She enjoyed dancing, baking and cooking, traveling, and any time she could spend with her loved ones. She was the life of any gathering, and her laugh, wit, and charm radiated throughout any room she graced. Besides her parents, Ann is predeceased by her daughter, Bonnie A. Brown, her former husband, Glen M. Brown, her five sisters, Helen Manor, Colleen Ross, Madeline Beebe, Bessie Aubin, and Agnes LaMore. She was also predeceased by her longtime companion, Stephen Herman. She is survived by her children and their spouses, grandchildren, many great-grandchildren, and a great-great grandchild. Ann’s children include her daughter, Marilyn Bascue and husband, Alan, of Whitehall, NY; her son Glenn Brown and partner, Michael Thompson, of Poughkeepsie, NY; and youngest son, Larry Brown and wife, Iris, of South Glens Falls, NY. Her grandchildren include Angela Bascue-Haley and husband, Bill, Kris Bascue and companion, Tanya, Craig Bascue and wife, Pam, Chad Bascue and wife, Mary, Jacqui Royael and husband, Scott, Lindsey St. Clair and husband, Travis, Larry Brown Jr. and wife, Kristin. Her great-grandchildren include Ciayera and Krisandra Greenough, Codie and Miranda Bascue, Michaela and Alexandra Bascue, Carson and Juliet Brown, Maya, Parker, and Nora Royael, and Graysen and Cameron St. Clair; her great-great grandson, Caiden Barrett. Also surviving are her brother, James Burke and wife, Betty, of Alphaus, NY, and daughter-in-law and long time friend, Erin Barber, of Hudson Falls, NY. The family would like to extend a special and heartfelt thanks to the staff and residents of the Glens Falls Center. Their care, support, and friendship were invaluable to Ann and her family. Friends may call on Ann on Friday, April 12, from 5:00 to 7:00 P.M. at the Michael G. Angiolillo Funeral Home, 210 Broadway, Whitehall, NY. At the close of visiting hours, friends and family are welcome to offer words of remembrance and reflection. A Mass of Christian Burial will be celebrated on Saturday, April 13, at 11:00 A.M. at Our Lady of Hope Catholic Church, 9 Wheeler Avenue, Whitehall, NY with Father Rendell Torres. The Rite of Committal and Burial in Our Lady of Angels Cemetery in Whitehall, will immediately follow the Mass. Expressions of sympathy, in lieu of flowers, in Ann’s memory may be made to the American Lung Association, 418 Broadway, Albany NY, 12207 or at www.lung.org. To leave an online condolence, visit our website at www.angiolillofuneralhome.com.